The end of the quarter really isn’t the time to write brilliant posts. Therefore, NSTA posts will have to wait for a couple of weeks. I’ve been thinking a lot about a new series of posts. I find that the way I run a physics curriculum for non-traditional physics students* goes against the grain of the way things are “supposed” to be. I have found this “against the grain” approach very successful with my students. At a session with Raymond Serway (the writer of the Holt Physics textbook), I was encouraged about my approach when Serway very seriously spoke about the mistake that most teachers make: trying to cover the material in a more collegiate way and ending up spending September through January on kinematics alone. I figured that there must be other teachers in the same boat, so I’ll start writing about the teaching techniques, lessons, etc. that have been successful. Please let me know if there are any particular areas that should be addressed. *My non-traditional classes are made of 11th and 12th grade students who are mostly enrolled in Algebra 2, some have Trigonometry, and only one or two have any Calculus. About half of these students will attend college after graduation and few will take physics at the college level. As promised, I will be writing up some of the sessions I attended this past weekend…since this was my first conference as a presenter, I spent less time in sessions as usual, but I did learn quite a few new tricks! This weekend was also exciting since the conference was held in San Francisco – thousands of science teachers in a city with a tsunami warning; I can bet lots of lesson plans were changed (including my own) to focus on the current events in Japan. 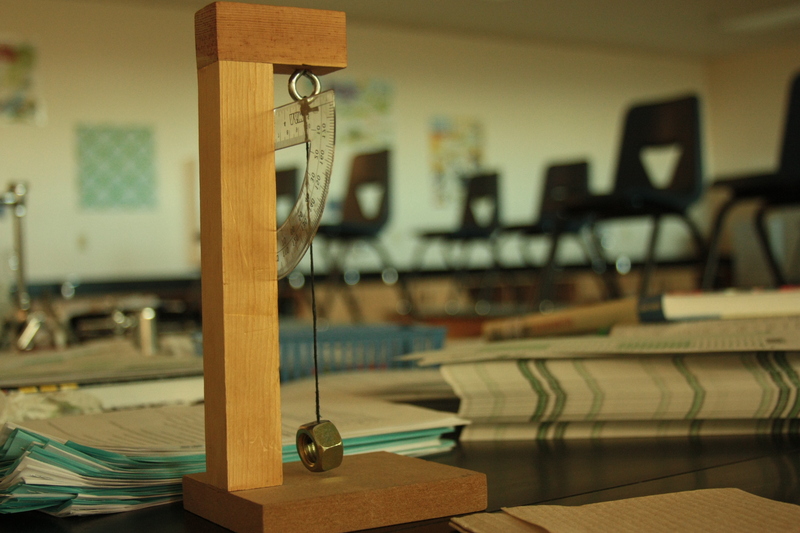 I have this tiny little pendulum (pictured above) one of my students made me last year, so I set it up and had my students brainstorm every type of physics they observed. We went through the whole list (velocity, centripetal motion, friction, gravity, momentum, energy, etc) and discussed each one for a short bit. Next, I described the importance of pendulums and we brainstormed a list of pendulums in “real life”. Some classes were more creative than others, but the point was clear that pendulums are everywhere. MASS – the pendulum is essentially in free fall and we know that mass in negligible in free fall, so no need to deal with it here either. GRAVITY – will affect every pendulum equally, so it can not affect individual pendulums diferently. AMPLITUDE – to test this we timed 10 oscillations at a low amplitude and 10 at a high amplitude. The times were almost exact, so the students understood that it does not affect the period. Therefore, the length is the only variable to affect the period of the pendulum. Vocab came to play here as we defined amplitude (height of pendulum), period (time it takes for one cycle to occur, measured in seconds), and frequency (number of cycles that occur in a given time period, measured in Hz). I wrote the definition of period and frequency on the board as equations as well as the inverse relationship between them. The students then did a few sample problems from the textbook (Hewitt Conceptual Physics – awesome resource!). To finish up the period, we graphed the position-time graph of the pendulum and the light bulb went off and the kids realized the connection between the pendulum and waves. They drew a transverse wave and labeled the anatomy in order to conclude the lesson. We’ll pick up with types of waves and the wave equation tomorrow. I started the fluids unit this week (I’m going shallow and wide with the curriculum so the kids can get exposed to as much as possible). For some reason, my kids love talking about and asking questions about buoyancy, Bernoulli, pressure, etc. What is suprising me the most is that the kids who usually don’t pay attention or do their work are the ones most enthralled. And when I say enthralled, I mean interrupting class every 40 seconds to ask questions when they are usually talking with friends or resting their head on the desk. It’s baffling. I have no clue what the reason is for the changes, but since it has been so successful, I figured I’d come up with something to share. Check back soon for a summary of the scaffolding I’ve provided them with over the last few days.. I hope it will help somebody! Well, technically today is the first day of my school week, but I’ve been thinking about school so much it feels like the middle of the week. Tomorrow is the first day I’ll be in the room on my own since my contract has been finalized and Ben (the best long term sub EVER) is now leaving me. I’ve really enjoyed team teaching with Ben and have learned so much just from working with him! I’m a bit nervous about handling the freshmen classes alone since the rowdy boys have responded so well to having a male teacher. I’m definitely going to miss having somebody to laugh with over silly student comments and behaviors. I’m also preoccupied with nerves over administering my first test tomorrow. I have intentionally given them a test much easier than things we have discussed in class because the kids are struggling with so many deep-seeded confidence issues that they need to prove to themselves they can do it. They have been giving up on assignments if they don’t understand or get frustrated, so I am encouraging them to at least try everything once and then come to me for help instead of just giving up. These kids have never been held to a high standard, so they have never learned how to work hard and with perseverance. I’ve already made it clear that those attitudes are not acceptable in my classroom. Since most of our kids are at or below the poverty line, I have felt a huge burden to help them find financially viable college options. This has led me to assume the responsibility of military academy liason – I am organizing and running several events to help kids apply to the military academies. The deadlines are coming up quickly (all congressional recommendations must be submitted by October 31), so there is a lot of pressure to get this off the ground immediately. Last year was the inaugural year for the school and they did not have a 12th grade class, so this is the first year any college and career related events are necessary. My Adopt-A-Classroom page has been an extreme blessing. Room 1007 has received way more money than I had ever expected. I am so honored that you would invest in us and I have many plans for purchasing supplies and equipment to assist the growth of my students (a class set of calculators is high on the list!). Going into the fourth week of my first year, I’ve been doing some cognitive assessment – how am I doing? Am I managing the stress well? Where can I improve? Am I doing a good job reaching out to all my students? I am pleasantly surprised that stress has not really been a part of the last 3 weeks (other than not getting paid). I have been able to consistently plan almost a week ahead and my planning for students understanding has been right on. I need to continue to set high expectations for my kids and hold them responsible for their academic decisions. There are a handful of students I need to initiate relationships with because I still don’t know anything about them. But on the whole, I do not feel the overwhelming anxiety I was told to expect during my first year and did experience during student teaching. When I’m with my kids I’m in my happy, comfortable place. Thanks for following and reading my mid-week thoughts – it is so helpful to have a group of educators to chat with over the daily joys and trials of teaching. Next week is spirit week, so I think on Nerd Day I might dress up as Ms Frizzle – any suggestions as to where to find a crazy dress?! Wow, the third week of school already; the week flew by so quickly I can barely remember what happened! In Physics, the kids are finishing up linear motion and getting ready for their first test. They have been working very hard to catch up with the math they are behind on (most are just taking Algebra 2) and are starting to think like Physicists! We are having so much fun. My biggest goal for them is to learn to work harder – they all tend to be extremely lazy and refuse to believe that they will learn and grow if they practice. I am pretty confident the source of this attitude is from growing up with teachers with low expectations. The other struggle we’ve had is understanding the concept of “units”. We spent almost an entire class period working out the difference between quantity (the thing being measured), unit (the type of measurement), and the relevant equations. I think they’re starting to get it. My freshman course is pretty funny. They are not as much of a handful as I had anticipated, just young and immature. We have been discussing renewable and non-renewable energy sources and essential materials for survival. It’s a spiralling curriculum, so all of the content we’ll cover is related to sustainability. It will also prepare them for the state science proficiency exam they will take in 11th grade. I like that the class can be more of a seminar and less lecture. My goal for these students is to teach them to be more responsible – they see homework as an optional extracurricular activity. We’ll get there! My kids have far surpassed my expectations. Many of them haven’t taken trig yet, but they have been working so hard to catch up in physics. They come to class prepared and are learning to ask more questions and use each other as a resource. However, they can’t seem to understand the concept of units. If anyone has had this issue please let me know! !